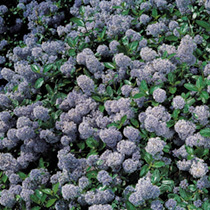 Ceanothus thrysifolius var. repens is a low-growing evergreen shrub, covered in late spring and early summer in small light blue fluffy flowers. It is best grown against a sunny wall to provide protection in winter. Height 40-50cm. Supplied in a 3 litre pot.